Scoffed culinary school partners, Nadine Silverberg and Mark Busse, believe in getting people into the kitchen and having fun with food. To this end, they regularly stage kids parties and adult cooking classes in French, Spanish, Italian cuisine, and now, for Tasting Australia, a native Australian cooking class, aimed at introducing curious cooks to native ingredients. Adelaide Market stallholder Richard Gunner of Something Wild is a supplier of native greens, native herbs and native game. Its genesis was at Richard’s family farm in Meningie, where “a whole lot of stuff grew in the paddocks” that they regularly cleared as weeds, but chefs were learning to love. Something Wild is majority owned by indigenous families, including ex AFL players Daniel Motlop and Leon Davis, and these traditional aboriginal land managers have helped to overcome the fears of park rangers of over-harvesting, enabling them to set up a commercial business. Standing before a crowded room, at Scoffed just off Magill Road, St Morris, Richard introduced us to the origins of several indigenous ingredients, how they are traditionally used among indigenous communities, and how they can be used in modern Australian cuisine. We were invited to try acerbic quandongs, tiny bush tomatoes, the salty crunch of karkalla perfect in salads and stir fries, the Coorong’s delicate coastal rosemary and intense native thyme, succulent samphire, finger limes, muntries – look like capers, taste like sour apple – lemon myrtle and strawberry gum with its hidden flavours of berries and passionfruit (scratch and sniff for amazing results), all sourced from the South Australian coastline and outback Australia. As we tasted, Richard talked of a new era in Australian culinary history, where chefs are now working with Australia, not fighting it, by using those ingredients best adapted to our climate. As part of the introduction, Richard presented tasting platters, which sommelier Lisa paired with Amato Vino Bianco, a smoky, slightly peppery wine from the South Australian Riverland which blends the Southern Italian fiano grape and the Serbian slankamenka bela. 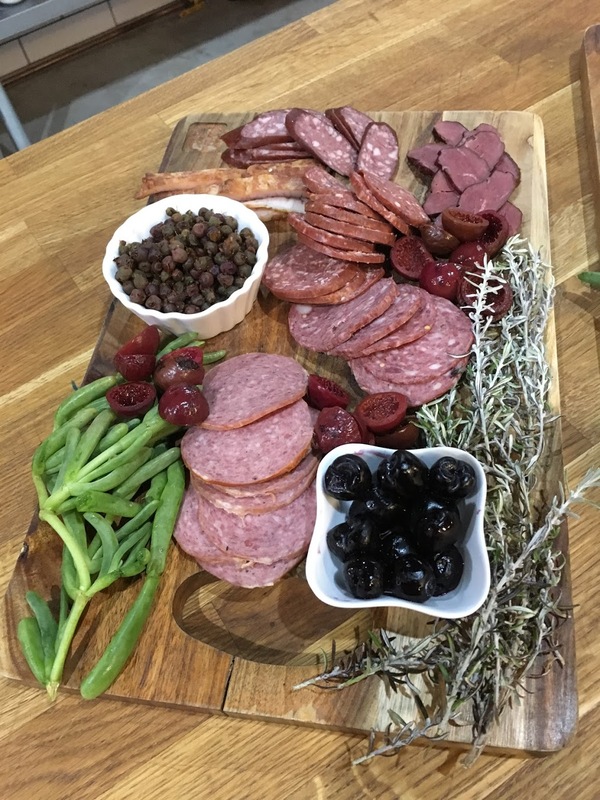 It was a perfect match with the selection of strongly flavoured, open range meats: camel and spicy kangaroo salamis, lightly smoked crocodile, emu kabana. Often medicinal, as well as edible for indigenous Australians, new Australians have invented fresh ways of bringing native ingredients into modern Australian cuisine, from ice-cream and desserts, to gin, pickles, chutneys and jams. Moving into the kitchen, head chef Lachlan took us through his fusion menu, incorporating many ingredients Richard provided. Lisa selected local boutique wines to go with each dish. Earlier, I watched Lachlan preparing sour dough bread rolls, flavoured with native pepper leaf. Later, he taught us the correct use of kitchen knives and how to shuck an oyster with a short, blunt knife, a sharp twist and a full body thrust. As some of us eagerly practised this new skill on a large heap of fresh Coffin Bay oysters, others prepared native finger limes to garnish them. Each course began with clear instructions and a short demonstration from Lachlan and ended at the dinner table. As the cooks started work, unfamiliar but nose-twitching aromas rose into the air from hot frying pans, and salivary glands went into overdrive. 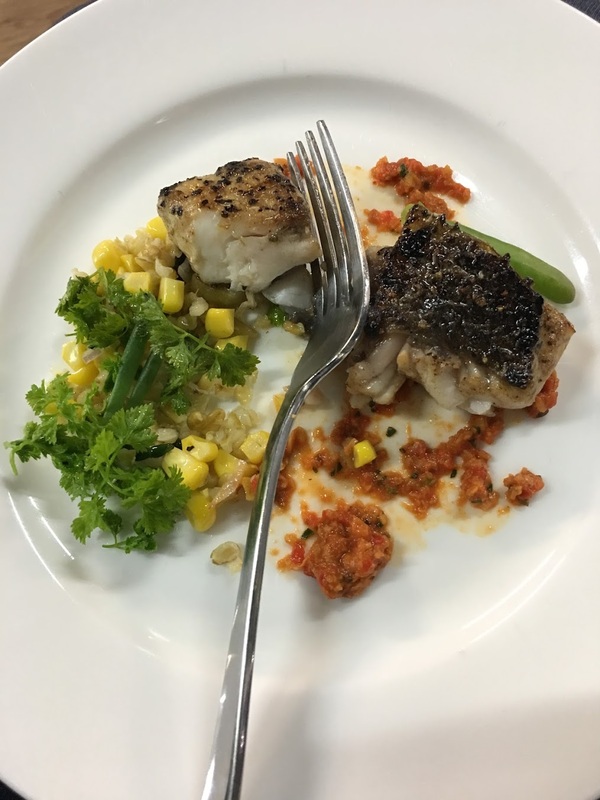 Barramundi steaks were dipped in pepper leaf, seared and served on a bed of spicy Romesco sauce, a divinely tangy, nutty red sauce we made from scratch, brimming with almond and native thyme, red peppers and paprika. A side salad of corn kernels and freekeh, dessert lime and samphire provided a clean, light balance to the rich sauce. Charlotte Dalton Wines 2017 ‘Love you, love me,’ a bright, Basket Range Semillon, proved a good companion. After a pause and a deep breath, emu fillets were rubbed in wattle seeds which have the nutty taste of roasted coffee without the bitterness. Chef’s tip: don’t overcook the emu, as it gets too chewy, and don’t forget to let it rest for a good medium rare finish. It was served with a Davidson plum relish – not too sweet – and baby green asparagus sautéed in the emu jus. Fervent chewing killed the conversation among diners, as Lisa poured a hefty 2017 Adelaide Hills Shiraz from Altamont Wine Studio. As the diners indulged, Lachlan made a start on dessert. First, a wattle seed pavlova briefly cooked in a large, shallow pan, slathered in whipped cream and rolled. The result was more sponge than meringue – light, but sickly sweet, as pavlova should be. To avoid waiting till next week for the ice cream to set, the crème anglaise – infused with lemon myrtle – was stirred into finely crushed dry ice and, abracadabra, the ice cream was ready in moments. And it was perfectly complimented by a dry and musky 2017 rosé from McLaren Vale’s Hither & Yon. As every plate was returned to the kitchen empty and wiped clean, we reflected that fun, friends, and flavour is a great recipe for success. This entry was posted in Australia, Food & Wine and tagged Adelaide, Adelaide Market, native ingredients, Scoffed, Something Wild, Tasting Australia. Bookmark the permalink.